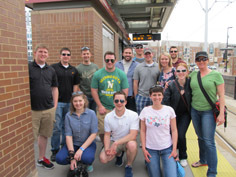 On Saturday, April 18, a group of public works professionals gathered at the light rail for a sun- and fun-filled afternoon of tours and socializing. The group got a firsthand look at new and fun pieces of infrastructure between Minneapolis and St. Paul, all while experiencing the green line and all it has to offer. At the first stop on the tour, the group learned about water reuse system and the construction of the Interchange transportation hub at Target Field. Next, the group got to see the $840 million Viking Stadium construction in action as crews lifted a steel truss into place. The awe-inspiring structure will be able to fit a Statue of Liberty under its dome when completed in 2016! As the light rail journeyed into St. Paul, the attendees learned about the APWA Student Chapter, urban planning as it relates to the “Surly” law, and engineers turned brewers. The tour ended at The Bulldog in St Paul for some final networking before returning on the light rail. Special thanks to all our guest speakers who showed us the new and exciting things happening along the Green Line!